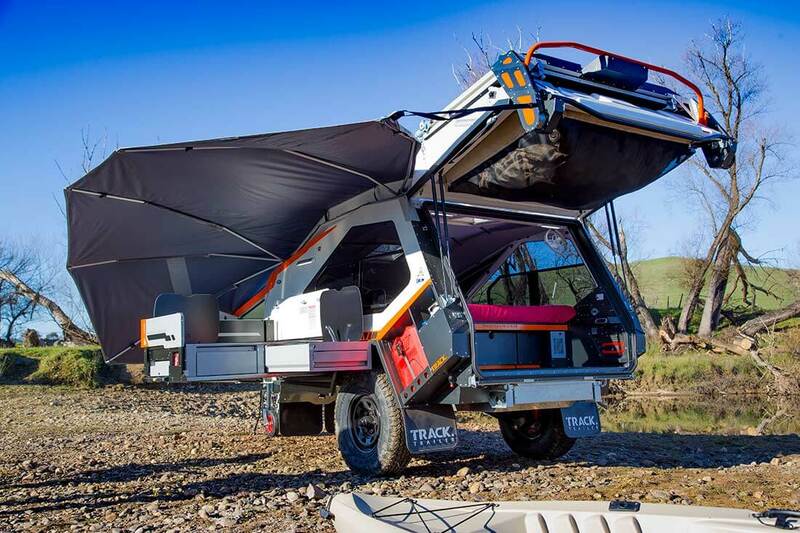 Since its launch in 2000, the Tvan Camper Trailer quickly became well known for its distinct design and industry leading off-road capabilities. Throughout the years the Tvan has been widely acclaimed by journalists, owners and explorers. The Tvan® has earned these accolades through continual design improvements and option development; evolving to meet customer expectations. 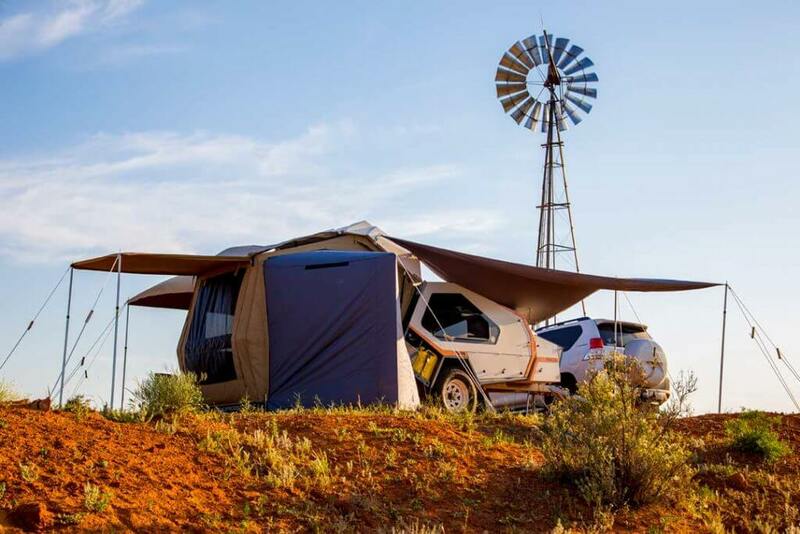 These achievements include, Camper Trailer of Millennium and Off-Road Camper of the Year in its category 2009, 2011 and 2015. The MK5 is the latest incarnation of the Tvan. Like all Track Trailer® products the MK5 Tvan Camper Trailer has been subjected to rigorous prototyping, which has tested new body panels, electrics and kitchen variants. Thousands of kilometers were travelled to ensure that the MK5 was worthy of the Tvan name. But the improvements don’t stop there! While maintaining the famous Tvan look, the MK5 has a raft of new features, making this Tvan the best one yet! Continue reading below to see why Nothing Compares. “For the buyer who simply wants the best on the market, grant yourself a few hours to take a tour through the new Track Tvan. “It’s one of Australia’s best known offroad rigs. A legend on wheels, some would say. That’s high praise, indeed. But whatever your background, it’s simply not possible to credibly claim that the Tvan hasn’t had a major impact on Australian offroad touring. 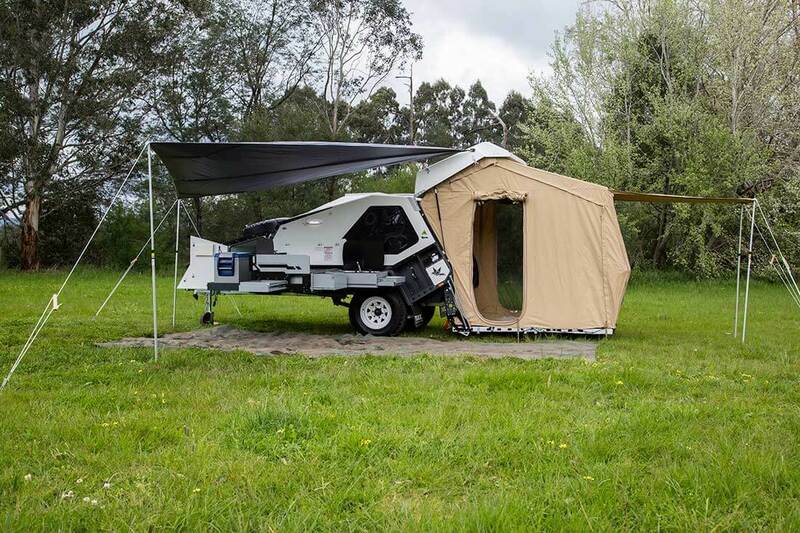 Camper Trailer of Millennium and Off-Road Camper of the Year in its category 2009, 2011 and 2015. The Tvan camper trailer advantage! Sleep under a hard roof with no flapping canvas. Protected from insects and the elements by strong walls that provide great insulation from noise, hot sun, cold nights and wind. When the tent is deployed (doubling your living space) it’s attached to a fold out hard floor, so you’ll be up off the ground, dry and secure. Most importantly, when it’s time to move on, your bed will remain made up and dry, even after a wet pack-up. * Content refers to both features and options available on Tvan. Please refer to specification and options list for accurate inclusions. The MK5 Tvan features a new roof which is approximately 100mm taller inside and is significantly higher throughout the bed / living space. The new roof gives more head room over the bed and throughout the cabin creating a light and airy ambience while maintain Tvan’s unique unitary construction, “a strong box” without resorting to a “pop top” which could compromise structural integrity, add extra weight and cause dust issues. The new roof also accommodates a 120w solar upgrade, doubling the previous solar input and making it easier to stay off the beaten track for longer. Speed is the new benchmark! One major advantage of the Tvan has always been its superior access to your equipment and living space by opening the rear of the van. Building on this, perhaps the most innovative part of the MK5 Tvan will revolutionise the way you access the rear of the Tvan. This is the Skyward™ Lift-Up Deck. As its name implies, this is the ability to lift up the deck of the Tvan with the hatch to provide unparalleled access to the rear of the Tvan. Simply press the button to release the electric locks and lift the hatch and deck to provide full access to the rear of the van, without having to lower the deck to the ground or stand on it while loading. To close simply shut like your car boot, with a satisfying thud. The MK5 Tvan now features the Quick Cover™ awning. This awning can be deployed in 2 minutes, packed up in the same time and provides substantial coverage over the kitchen, front box and side of the Tvan. With arms which pivot both to the front and rear of the van, the Quick Cover™ awning can be used with any level of van setup, including deck closed or tent deployed. When the tent is deployed, there is an additional awning piece which can be used to provide complete coverage over the entry door of the tent. This awning does not require the use of upright poles in calm weather meaning that a Quick Cover™ for a roadside stop is a synch. Hooks built into each end of the awning attach on the drawbar and rear of the van. 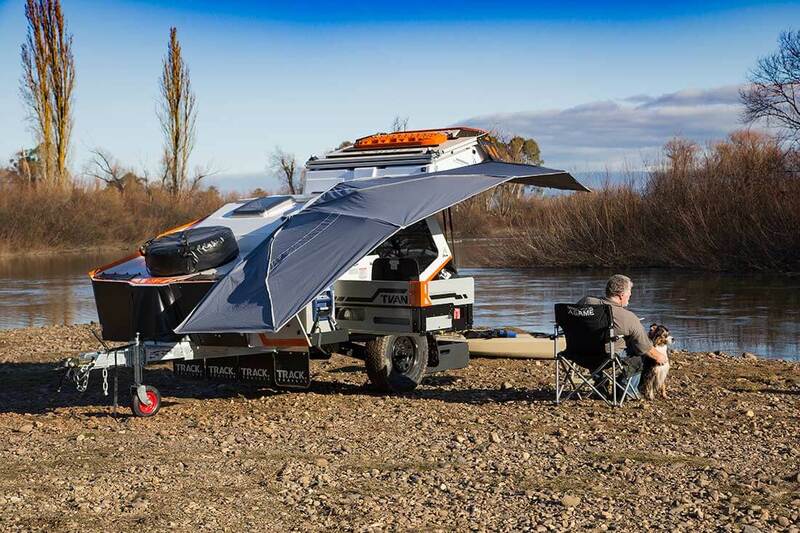 One of the best features of the Tvan Camper Trailer is its 30 second setup. Because the tent is stowed away in the rear hatch of the van and not on the bed, the you can choose whether or not to setup the full tent. Accessing the bed is as simple as unlocking four over centre catches, folding down the deck and releasing the gas strut assisted hatch. You might then choose to shut the hatch after yourself and go straight to bed (pad locks can be fitted to prevent the catches from locking) or to install one of the two optional rear door covers. The Tvan tent sets up in less than 5 minutes! 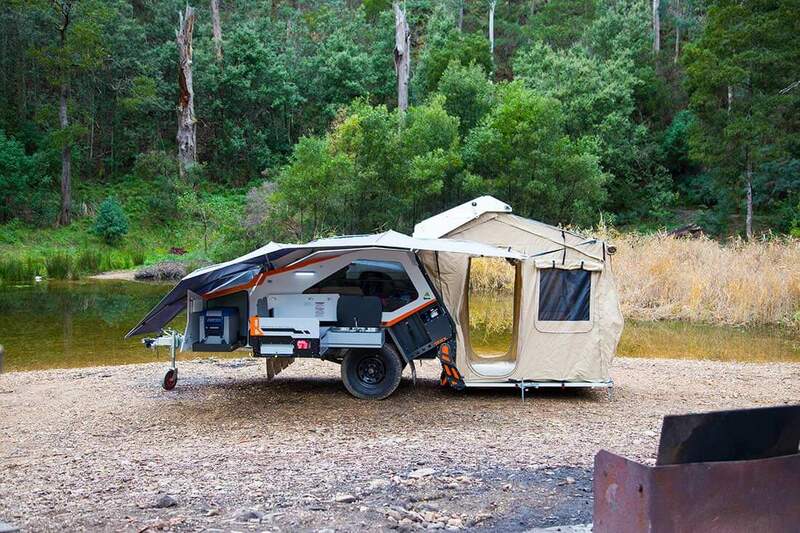 The Tvan Camper Trailer is amongst the quickest of the all camper trailers in the market to setup and pack up. We don’t make this claim lightly, but when the correct procedures are followed, our owners can and will be able to easily level the van, lower the tent, attach the floor and mouth to the body of the van and install the internal upright poles. Just reverse the procedure to store the tent and pack up. No canvas ever packs on to the bed – meaning no dirt or water or dust on the mattress and the bed can always remain made. You can choose if you want to set up the full tent or just do the 30 second setup with the rear canvas screen. Packing the van is a breeze because you don’t have to partially or fully setup the camper trailer to access gear in or around the cabin area. This annex takes approximately 15 minutes to set up and covers the full length of the Tvan. 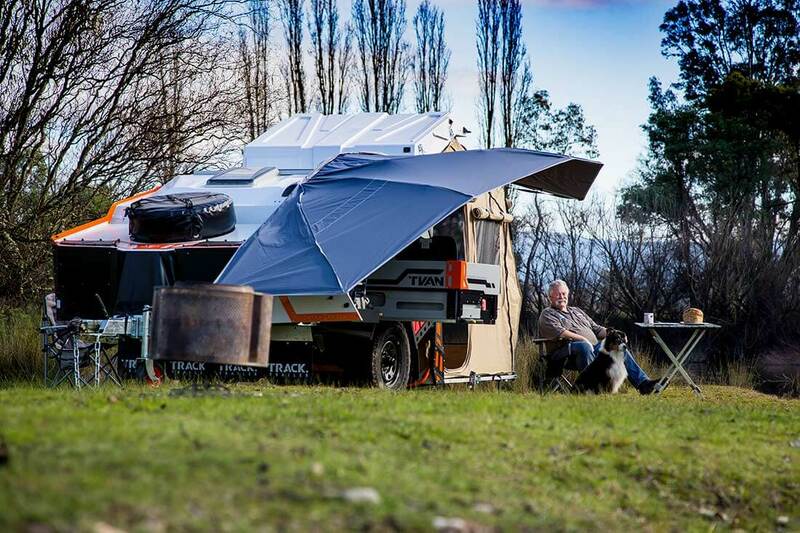 The Yulara and Tanami come standard with the quick erect and highly versatile sail awning. The sail awning attaches to side of the van and can be set up to protect against the elements or provide shade for quick stops. 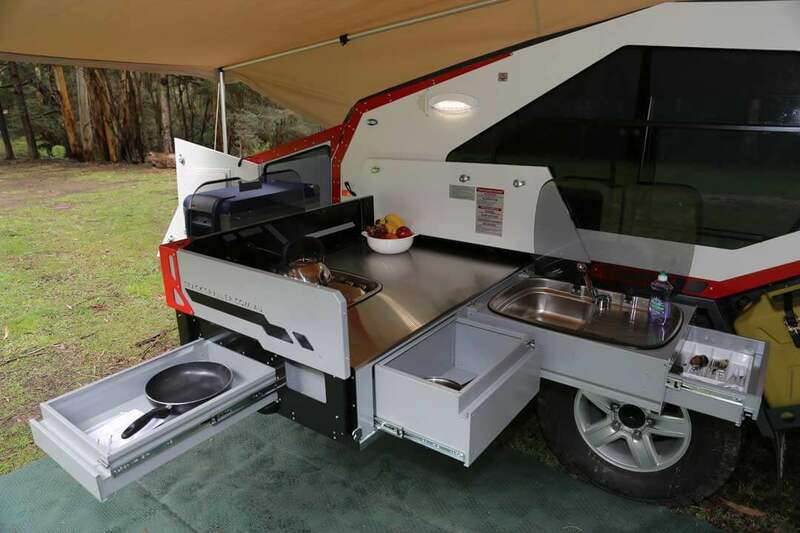 These days all camper trailers feature a slide out kitchen, however, nobody does it quite like Track Trailer. The Mk5 Tvan Camper Trailer features 2 completely new kitchen designs based off 15 years of customer feedback and continual improvement. Standard on the Tvan Yulara and Tanami. Standard on the Tvan Canning and Murranji. Occupying a 30% larger locker than the Classic Kitchen, the Premium Kitchen for the Tvan MK5 features twice the bench space of its smaller counterpart. The stainless steel benchtop utilises advanced sheetmetal techniques for a premium feel, including rounded edge. The powder coated, predominantly aluminium body makes access to storage a breeze, incorporating many drawers for the storage of all your kitchen needs. The Premium Kitchen boasts a Thetford 3 burner (2×1.5KW, 1×2.5KW) glass topped stainless steel cooktop with piezo ignition and matching stainless steel sink with flick style tap, draining board and cutlery drawer located below. The kitchen utilises a lock in / lock out handle which accommodates single handed operation and slides on Track Trailer’s own design of ball bearing runners. The integrated windshields are deployed by simply raising them into position. We’ve even fitted a bottle opener so you won’t have to go searching for your keys! The MK5 design provided an opportunity to fully integrate all the electrical options into one neat package. Specifications vary depending on model and selected options. Master switch for electrical isolation. 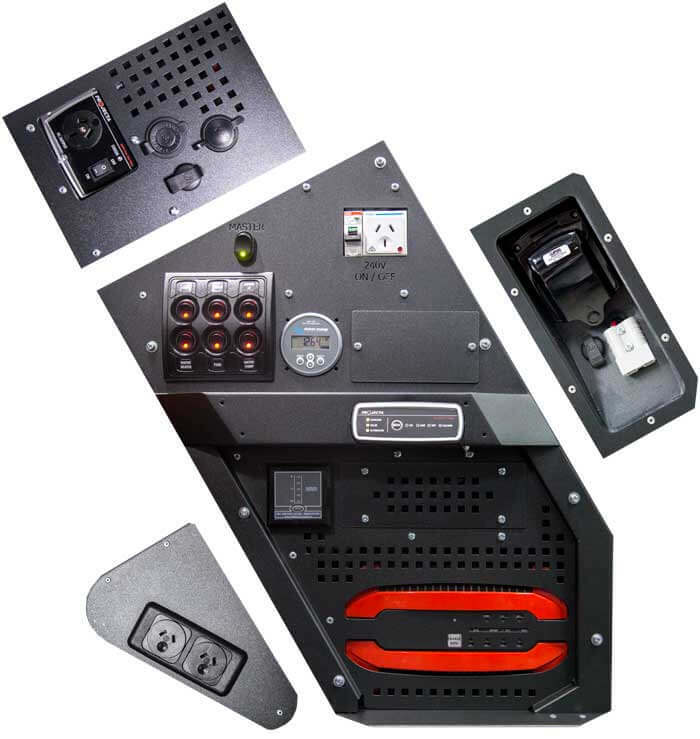 6 switch panel with integrated fusing for lights, stereo water pump and fans. All circuits are protected using built in circuit breakers. 240V outlets with safety switching, a dedicated front 240V plug for customer use and up to 3 internal 240V plugs for built in appliances. 2x USB chargers, 1x12V Merit plug and 1x 12v cigarette style socket. Water tank gauge for 1 or 2 tanks. Stereo options including docking station for your MP3 players. Projecta 300W or 150W inverter. 60 and 120W roof mounted solar options. The Tvan MK5’s all new stereo solution is so simple you’ll wonder why we didn’t do it sooner! Powerful power. Everyone agrees, if you want to stay off-road you have to get good at staying off grid. The all new Tvan Mk5 Camper Trailer has a shocking new take on power! Track Trailer has decided to set the bar high with the Tanami, Canning and Murranji models by including some serious power upgrades as standard. Lithium Batteries are now available and don’t require any special modifications to work with the Tvan’s electrical system. 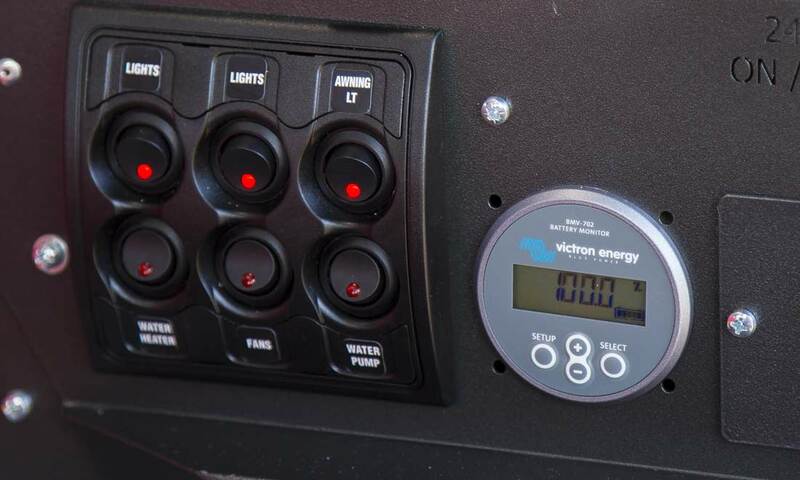 The new Lithium options feature a 90Ah upgrade from the AGM battery and a second 90Ah. Lithium technology maintains a higher voltage for longer offering almost 1/4 more battery capacity over an equivalent AGM at approximately half the weight (15kg per battery). 90 Amp Hours is actually equivalent to 126Ah in an AGM. 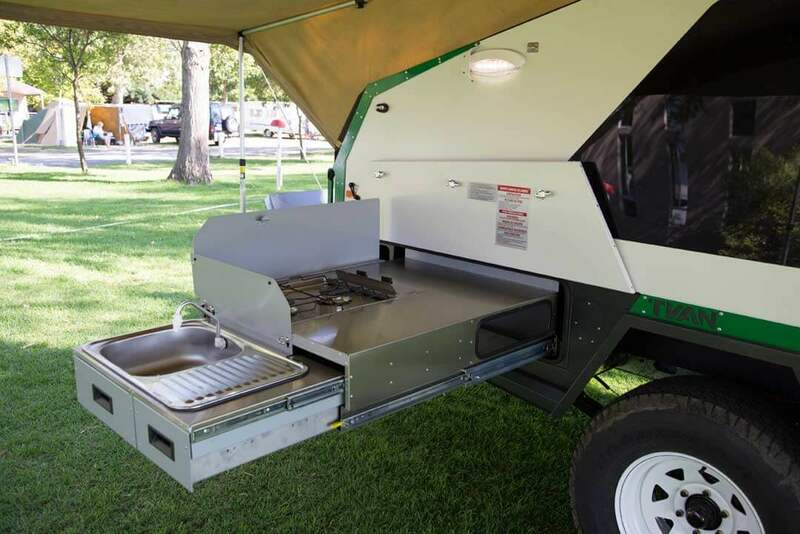 Track Trailer has used the proven a OEM system to provide reliable and efficient heating for the Tvan and hot water for the kitchen and shower. This popular system is comprised of a glycol heat pump, heat ex-changer (for heating), diesel tank and glycol storage unit. As you can appreciate, a system with all of these components takes up a fair bit of room and often the size of these components encroaches on useful storage space and takes up significantly more space than required. Not with the Tvan! Unwilling to compromise on valuable space, the Track Trailer team set about redesigning the plumbing, wiring and tanks (glycol and fuel) to repackage the entire combustion elements into 1 jerry can sized unit. This design eliminates messy wiring or plumbing running the length of the van. Most competitor products fit the fuel tank behind the front stone guard and the other components wherever they can, leaving long runs of wiring, plumbing etc, meaning more holes and more potential for dust ingress. This is another example why the Tvan is a far superior product. It occupies a jerry can carrying position on the Tvan rear of the axle, aiding in better weight management system. The tank can be filled at a bowser and easily on the LHS (away from the road). The Murranji comes standard with the Front Boot featuring two separately sealed compartments, one for generic storage and the other with a dedicated fridge slide and constant 12V power. The fridge compartment also features filtered air vents This boot accommodates a spare wheel and 2x gas bottles. There are many additional options available including, a RHS slide out tray, dual venting and power for up to 2 fridges, a fridge slide swap (RHS to LHS) for longer fridges and a optional height LHS shelf. Total box length is measured from the center divider to the door mounted filter. Tray dimensions are measured to the inside of the tray, note that tie downs protrude in each corner so a fridge which is tight in both length and width may need these removed. Height is measured from the tray to the low side of the seal. All information was correct at the time this was posted – It’s advisable to measure your fridge to be sure. The Yulara, Tanami and Canning are delivered standard with a drawbar frame that has provision for up to 4x jerry cans, 2x gas bottles & 1x spare wheel. It’s also fitted with large metal stone guards to protect the body and a dust cover for the spare and gas bottles. Options also include a wood carrier and bike racks.